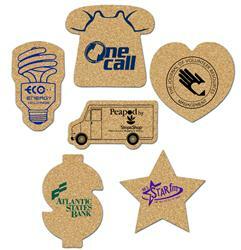 Custom shaped cork coasters by Adco Marketing. Fun cork coasters in dollar, house, light bulb, heart shape and more. Classic cork coaster - with a nice 1/8" thickness. 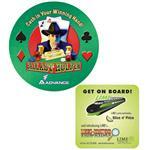 These are great and inexpensive bar gifts or trade show giveaways for desktop use. This makes for a nice direct mail piece, invitation to a party, goodie bag filler, and desk top gift. We love to help at 888-332-ADCO. Hundreds of cork coaster shapes available! Available Colors: Natural cork coaster. Production Times Available: Standard 7 to 10 working days. Rush available - please inquire. Dimensions: Varies, but all are 1/8 " thick. Typical Imprint Area(s): 2.5 inch diameter. Cork coaster. Shapes available. Full color available with run charge.